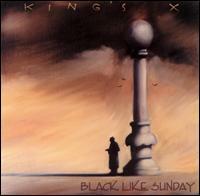 To me, it seems like only yesterday that King's X released their 2003 album Black Like Sunday. At the time, I was living in a tiny one-bedroom apartment and didn't really have a disposable income, but I bought the album anyway. This is a unique King's X release because it consists of songs that were written and performed in the band's early days, in some cases even before they changed their name to King's X. So, at the time, the album sounded very strange to me. It felt like a throwback to the 80s, because the songs on it basically were 80s songs. It was a big departure from the band's post-Dogman work, but by the same token, it was a major step up from Manic Moonlight, released two years earlier. In the context of the band's catalog, Black Like Sunday feels like an album released by a band that no longer really knew who they were. Manic Moonlight was such a goofy, drum-machine-driven, experimental album from a straight-up rock band that I think it alienated a lot of fans. This was especially true in light of the fact that Tapehead and Please Come Home... Mr. Bulbous were widely considered to be the band's return to a very reinvigorated form. That vigor piddled-out with Manic Moonlight, and Black Like Sunday felt almost... lazy at the time. I remember thinking, "What? They didn't write any new material for this album, they just recycled a bunch of old songs?" It was disappointing. I must have listened to the album a dozen times, and then put it away for a long time. When I finally went back to it, years later, it was no longer "current." As a result, I was able to hear it with fresh ears, unbiased by a linear time perspective. Finally the album clicked with me. Finally I was able to accept the album on the level it was intended. Some of the songs sound odd because when the band became King's X they started channeling their energy into a signature sound. These old leftovers are great songs, but they wouldn't have fit in with the songs on early-90s King's X albums. Some songs were ahead of their time, for the band. A song like, "Finished," for example - possibly the strongest song on the album - would have a been a great one to include on ...Mr. Bulbous. Other songs, like "Johnny" and "Rock Pile" seem almost ironic, coming from a veteran rock band that never really managed to have a break-out hit. But, at the end of the day, Black Like Sunday is a testament to the idea that it's important to take music for what it is, rather than what you imagine it ought to be from a fan's perspective. With a little emotional distance and some properly calibrated hindsight, I was able to fall in love with this album completely after a few years. In fact, it might very well be one of my most often-played King's X albums, which is very surprising when you think about it.